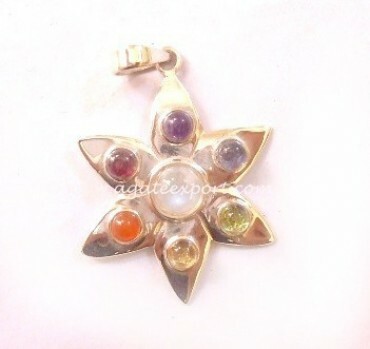 Lotus seven chakra pendant is lotus shaped and a symbol of Buddhism. This fine piece of pendant represents purity and peace. The seven stones on it represent seven chakras, which are responsible for distributing energy in different parts of the body. Each chakra affects a different region and brings out different qualities. Agate Export brings you this stunning pendant at a reasonable price.